This installation consists of three DVD projections into three water-filled wooden tubs. 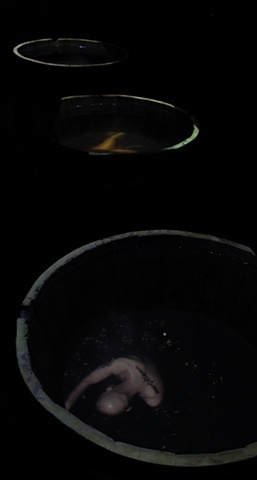 Each projection documents an actor improvising being captured underwater in the tubs. The actors behave in a controlled manner, referencing and restricted by the internal space of the hot tub. Its a metaphor of the boundaries enforced upon the individual by cultural, sub-cultural and self-identification codes.